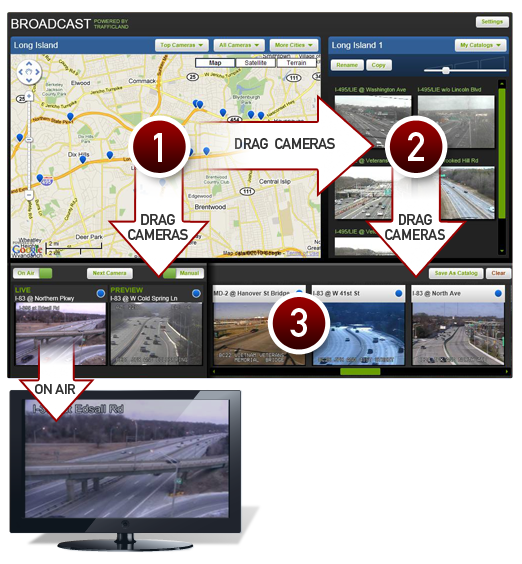 Broadcast Service | TrafficLand, Inc.
Broadcast makes it easy for TV stations to use live, broadcast-quality traffic video from local DOT cameras on-air to report traffic, weather and other news. The application features an intuitive drag-and-drop interface that makes it easy to find and queue traffic cameras for broadcast. Find cameras using an interactive map, camera listing, or text search. Easily queue and update cameras for broadcast. Control camera switching effects and timing. Avoid cost of maintaining equipment at DOT traffic centers.